My name is Darrell. I’m 10 and my favorite flavor of ice cream is chocolate peanut butter. 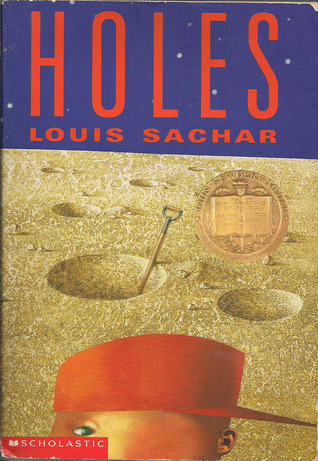 I chose Holes because my teacher recommended it to me. Plus I saw the movie and I thought it was really funny. My favorite part of the story is when they saw all the yellow spotted lizards. I loved how suspenseful it all got. I think I would probably try to become friends with everyone. And then when we were all friends, we would plan an escape. Maybe we would capture some of the lizards to use as weapons or train them to attack Mr. Sir or the Warden if they tried to chase us. But we wouldn't hurt the lizards. When we escaped, we'd keep them as pets and I'd name one after myself. I would tell Eyan that this book is full of adventure and is hilarious. I'd also tell him that there's a part where a kid steals a truck. At first I couldn't tell that Stanley's face was at the bottom. I didn't really know what the orange thing was. But then I saw the eye and I figured it out. I like how it's at the very bottom like he's peeking at you. He's being kind of mysterious and sneaky which fits because he's really sneaky and smart in the book. I would love to read a book about Zero's life. I thought it was really cool how he ended up being smart even though he couldn't read. And he's also related to Madame Zeroni and it would be fun to see what his family is like. I think A Snicker of Magic kinds of reminds me of this book because both of the characters start out in a brand new place. And then they meet a lot of different people and make some friends. And then you find out that there's some magical thing in both of the stories and you get to learn about the history of both of the places. I really like that about both of those books. I would want to know if the author ever had to go to a camp as bad as Camp Green Lake because it's pretty awful and I don't see how the parents would even let their kids go there. While I couldn't find an answer to Darrell's question, Louis Sachar has a pretty excellent "Holes Q & A" section on his website! Thank you, Darrell, for sharing your thoughts with us! I love this interview (and this book! )!